We are excited to announce our newest initiative that will give Source Audio publishers the ability to distribute their music to all the major digital retail, streaming and internet radio sites! 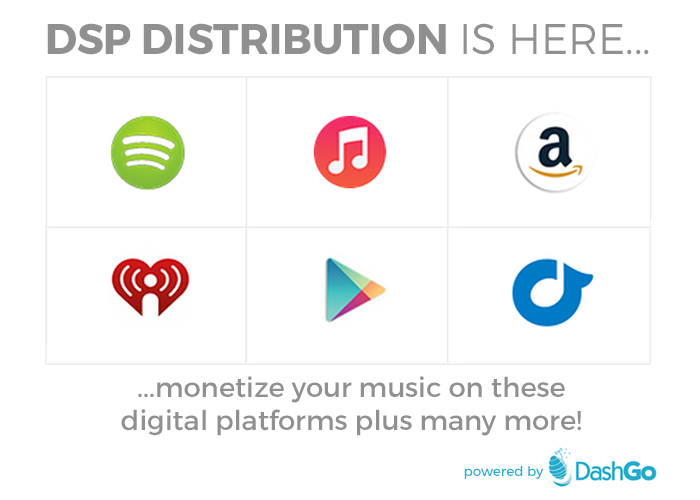 In partnership with DashGo, the leader in DSP distribution for production music, you will now have the opportunity to earn additional revenue from your catalog. DashGo has years of experience in creating commercial releases from production music libraries and well-known indie labels with a specific focus on positioning and marketing tracks within the DSP's. This program has zero set-up fees and no annual subscription fees, so there is no risk, just the potential for earning more revenue from your music. Review and digitally sign the new agreement located in the Programs and Opportunities section of your Admin Panel. Select the tracks and albums on your SA site that you'd like to submit (non-exclusive and sub-published tracks not eligible). Your tracks are compiled and reviewed by DashGo and then directly submitted to the DSPs.